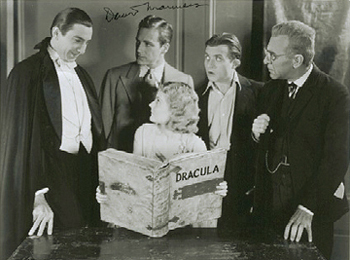 The film version of the 1927 Broadway play, 1931's Dracula stands as "Triton among the minnows." Count Dracula leaves Transylvania and terrorizes London, creating chaos in the lives of an English physician and his daughter. DM plays John Harker, the bemused fiancée who is aghast at Prof. Van Helsing's seemingly ludicrous medical practices. A difficult role to play to say the least, DM takes it off with charm, dignity, and grace. To me, he and heroine Helen Chandler create the most strikingly appealing leading duo in horror film history. I asked David once who his favorite leading lady was. He replied quickly and assuredly, "Helen Chandler." David then asked me why I loved Dracula so. He went on to say, "You know, I'm so awful in that film!" This is the ultimate horror film, without which Frankenstein most certainly would not have been made. Lugosi's performance defined the role for all time and is the standard by which all future interpretations are judged. The current trend to compare this masterpiece to the Spanish version of Dracula is not only foolhardy; it is insulting. Lugosi's dynamic persona and impassioned performance are what drive Dracula and make it what it is and will always be. Mean spirited attacks have been leveled against this film for decades, only to increase in ferocity with the release of the Spanish Dracula. And now, in an apparent attempt to make Dracula more acceptable to modern audiences, Universal has added a new musical score. The absurdity of this is that one of the elements that makes Dracula so creepy is its lack of background music. The silence adds to the claustrophobic sense of doom the film evokes. That silence coupled with Lugosi's own hypnotic voice and inscrutably "musical" delivery sets abroach a cinematic experience that stands alone in the history of film. The new score also runs riot over much of Dracula's dialogue, treating it as if it were a silent picture. (Actually, being that in early 1931 many theatres were not equipped for sound, a silent version of Dracula with sub-titles did see a limited release.) The final insult is that the new score does away with Dracula's signature theme, Swan Lake, creating a new and wholly unacceptable aesthetic, not at all in keeping with Tod Browning's meticulously constructed mood. As to another common attack on Dracula, that its horrors occur mainly off-screen, today's "sophisticated" audiences should remember that this provokes the mind to imagine its own terrors and is also a matter of taste. It will never be equaled, much less outdone. As for the critics and their mummery, let this be their res judicata, "O most lame and impotent conclusion." Purchase Dracula in DVD format through this Amazon.com link and a portion of the sale goes to the David Manners web site. Help support this site with your purchase.